It was the third time that my son called out to me that I got frustrated. Don’t get me wrong, I love my kids but at bedtime? I’m ready to sit and relax with my husband. Even for a few minutes before we both go to sleep. Maybe you’ve been there too? The kids are calling out for you. Talked to them about their day…and more. They keep calling, “MOM!” every time you close the door. Or, worse yet, they keep coming out of their room asking for something (ANYTHING!) that gives them an excuse to come out. I find that this happens on the days when I’m MOST tired and I don’t have a lot of patience, don’t you? I need to back up a bit though. I bring all this up because I was starting to feel frustrated with my older kids (4 & 7) who were constantly calling out for me. Sometimes, I was even getting angry. And, that’s not how I wanted to end the day with my kids. Kid #1: Hey, Mom? Can I ask you a question? Kid #2: I’m not tired anymore, Mommy. Kid #1: Yah, about that question though: I love you, Mom. ME: Thanks, honey. I love you too, but tell me before I turn the lights off, k? Kid #2: MOM, I’m afraid of the dark. I can’t fall asleep now! I really empathize with my kids. See, I used to struggle with falling asleep at nighttime too. I know what it feels like to be afraid of the dark, so I feel terrible for my kids when they’re scared in their beds. But, I was getting so tired of the kids calling out for me that I had visions of locking the door and running away like Forest Freaking Gump. I don’t know about you, but that’s not the way that I want to parent my kids. The problem with this “bedtime routine” was that calling out to me after I shut the door was becoming a habit. And, night after night, this habit was becoming something that my kid’s HAD to do in order to fall asleep. I had to break the habit. There was one night when my daughter called out to me because her little brother was feeling sick. My husband was out of town and the kids were calling out all week long. I was more than exhausted. Child #1: I thought you’d be upset but M needed you. ME: I’m not upset, really. It sounds like you really needed me. Child #2: I need covers. ME: Got it. (I covered him up) Listen, I’d love to come in here over and over all night because I love you guys, but remember – once you are all asleep, Momma gets to sleep. And, Momma needs to sleep so I don’t wake up like a grouchy bear. I want to be a Momma bear who’s calm, ready to wake up and ready to hang out with you. I think I had to pick up my jaw from the floor. This was the first night in a long time when my kids fell asleep easily without calling out to me over and over. After our little convo, my kids said, “okay, goodnight Mama” and I knew that we were on the path to breaking the habit of me going in frustrated and practically ordering them to fall asleep. Then, so did my kids. I’m not a therapist, a Doctor, or someone who’s super fancy (hello, I live in yoga pants…), but I will say that I’ve worked with young children my entire adult life. And, I’ll tell you this: kids know when you are being genuine and honest. My best advice? Get real with your kids about bedtime. It’s okay to tell them that you feel frustrated when they call out for you every single night. It’s okay to tell them that you’re challenging them to try a new bedtime routine because you’re tired of being a grouchy bear at bedtime. In order for you to get sleep, they need to go to bed too. I find that’s the key: Remind them that it’s not just THEM who need sleep, YOU need sleep too. And, you can’t go to bed until they do. First, let them know that calling out for you over and over isn’t going to work and you’re going to try something different. When it’s time for you to leave, your kids can choose from one of the three things below. Afterall, you get that they want to feel safe and that they miss you at bedtime. Let them know that these strategies are here to help them. Let them snuggle with something that’s yours: This worked really well in my preschool classroom for a child who missed her Mom when she traveled. She’d bring in a huge towel-like robe with her to school for nap time. When my kids are ready for bed, I ask them if they’d like to snuggle with something of mine or my husbands? My kids love snuggling with sweaters, sweatshirts of mine, or our big cozy comforter (I let them know that I’ll be taking it back when I go to sleep, but they can use it while they’re falling asleep). Hug Your Kids Afterwards: Tell them you’ll come in when they’ve fallen asleep to give them a hug or a kiss. But, ONLY when they’re fast asleep. Then, actually do it. These are signs that you may actually be threatening them to go to sleep without realizing it. I’m not saying these are perfect solutions. I’ve learned to vary what I do night by night, so these strategies stay fresh. But, I always try to be upfront, calm, and honest with my kids. It goes a lot farther than using threats and anger. Don’t lie to your kids – get real about how you need sleep and how your sleep can’t happen until they’re asleep. Let them snuggle with something that belongs to you like a shirt or sweater. Write them a note or promise to give them a kiss after they go to sleep. 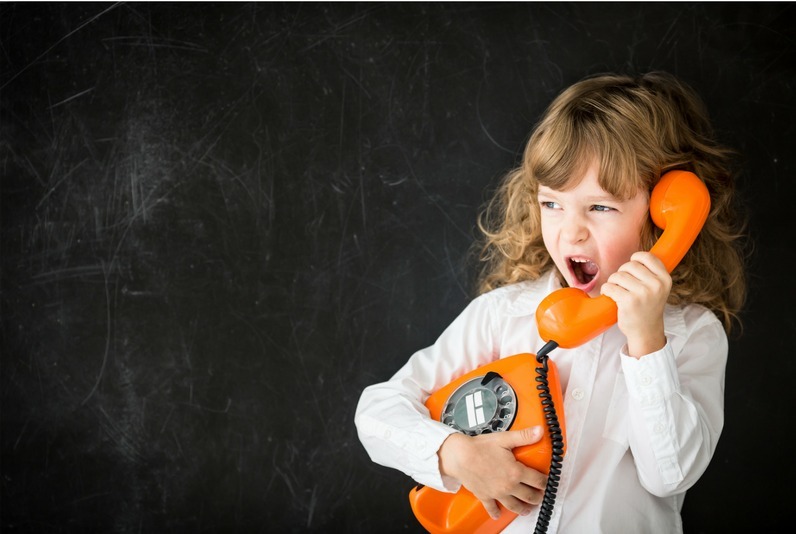 Avoid threats – remember, they often reject these strategies if you use threats. Above all – strive to talk to them calmly. Grab this free download and I’ll deliver it right to your inbox. Print it and put it on the fridge. It has all the reminders that you’ll need to stay calm and to help your child at bedtime. 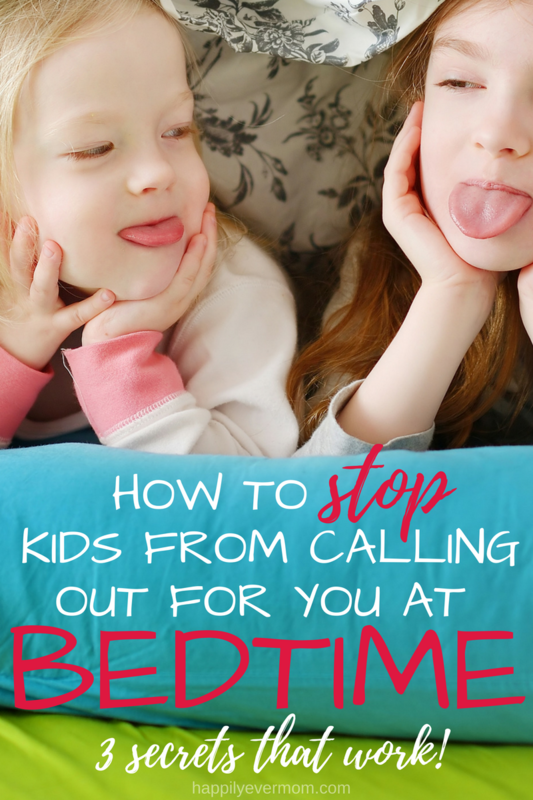 Stopping kids from calling out at bedtime can seem daunting. Feeling frustrated night after night with your kid. Nobody wins that way. If you use these tricks regularly, you’ll start to see what works for you and your family. And, then you won’t have to shut the door and run away like Forest Freaking Gump.